Earlier this week Ford took the brave and forward-thinking step of having their chief F-150 engineer, Jackie DiMarco, do an Ask Me Anything session on Reddit. It did not end well for her or Ford. DiMarco went in with a friendly attitude and a willingness to answer questions. Inquisitive redditors asked about her engineering background, the cars and trucks she's owned, her role at Ford and how she got there, and of course, she played up the strengths of Ford's products. She's a Ford employee. What else would you expect? But that didn't stop a number of redditors from saying the AMA felt like a Ford commercial — "an ad, in wall of text form" as one user put it. Many of them asked why Ford won't bring back the Ranger or another small truck or use more diesel engines only to have DiMarco primarily tout the fuel economy and power of the EcoBoost V6 engine. -This AMA is worthless, there are very few answers, several of them completely miss the question asked, and none of them provide any kind of fresh information. I always liked Ford, but, I am disappoint. -How do you still have a job? You should be ashamed of that shoddy piece of crap. -Yeah, getting the feeling that this was set up to push the EcoBoost engines as opposed to engaging in an actual discussion. Point to Social Media Consultants who push their clients onto Reddit: Talking points are not a discussion. Be open, be authentic, be honest, answer interesting and/or amusing questions, and don't ask your marketing team how to respond. -And that ama, folks, is why Toyota is winning. And perhaps worst of all for Ford, a number of redditors saw that those asking questions were first-time users, prompting them to ask whether "fake accounts" were set up to ask questions. Ford had to add a disclaimer box up at the top to clarify that DiMarco did, in fact, answer all of her own questions, and that many of the first-timers came there because Ford advertised the AMA on their Facebook and Twitter pages. But it definitely wasn't all bad. Many of the redditors asked well-thought-out, legitimate questions. DiMarco gave quite a bit of advice on her engineering career and how others can do the same. DiMarco was also funny and clever. When one redditor asks her "When can we expect a TRULY revolutionize (sic) vehicle? When can we start buying levitating Fords? ", she responds by saying "I have seen a Raptor go airborne." She came off as someone who enjoys her job and is knowledgeable about it. But this is Reddit, a place that thrives on cynicism and anonymity, and is therefore maybe not the best place for this kind of Q&A. 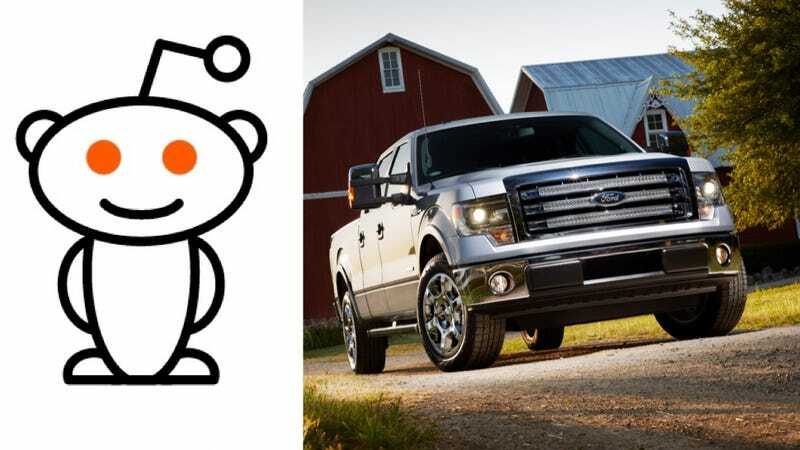 Ford truck spokesman Mike Levine reiterated to Jalopnik that no fake accounts were used, and that the AMA was a lesson that "People love trucks, and truck owners have very passionate opinions." Levine similarly dashed the hopes of redditors who want to see a Ranger comeback. "People asked about Ranger — that is a shrinking market segment," he said. "There's no doubt about it. The market for that was 8 percent in '94, and it's less than 2 percent today. Jackie knows the market because she's working in trucks every day." And now other automakers know what to expect if they do a Reddit AMA.